Show dates are April 12-13, 18-20, 25-27 at 8pm; April 27 at 2pm and 8pm; and April 14 and 28 at 3pm. 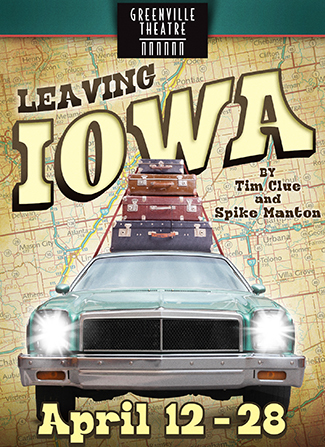 Greenville Theatre presents Leaving Iowa, a must-see comedy that broke box office records and received a nomination for Best New Play when it premiered. Don Browning is a middle-aged writer on a journey to take his father’s ashes to Dad’s childhood home, as requested. But when Don discovers that Grandma’s house is now a grocery store, he travels across Iowa searching for a proper resting place. This father and son road trip shifts from the present to Don’s memories of the annual, torturous vacations of his childhood. Directed by Allen McCalla, this all-star cast features Todd Janssen as Don, Shane Willimon as Dad, Beth Munson as Mom, Laura Sykes as Sis, Carter Allen as Multiple Character Guy, and Claire Clauson as Multiple Character Gal. Tickets prices are Adults $28, Seniors $27, and Juniors $20. For more information, please call the Box Office at 864-233-6238 or visit the GT website at www.greenvilletheatre.org.